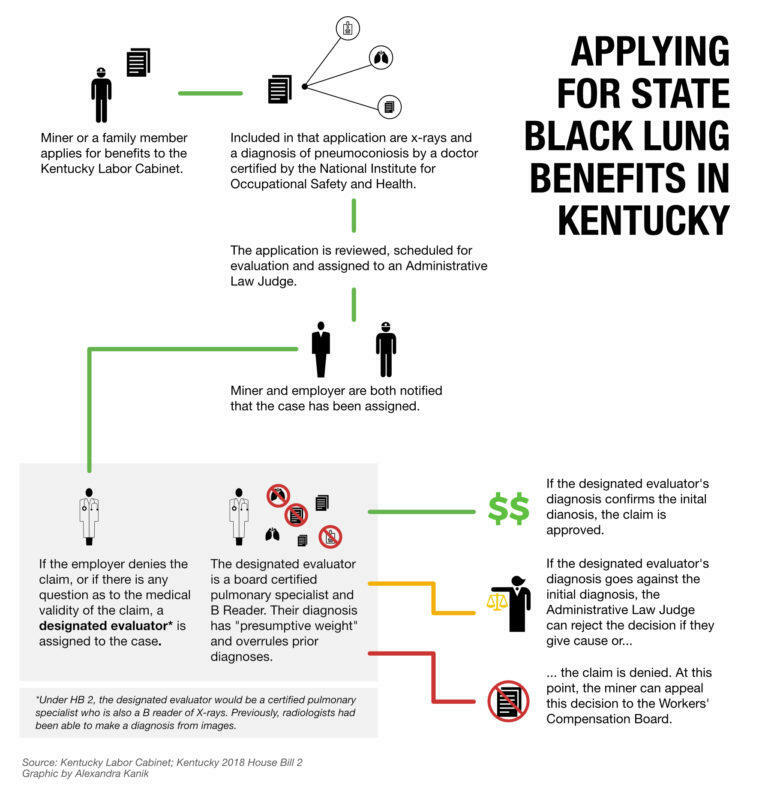 The law’s changes to Kentucky’s workers’ compensation system removed radiologists from the claims process, even though radiologists are specialists in reading in X-rays and are generally considered to be the most qualified among doctors certified to diagnose black lung disease. Under the new law, the national certification for diagnosing diseases like black lung is not sufficient. Doctors with that certification, known as B Readers, now also need to be certified as pulmonologists. A review of qualifying physicians by NPR and The ReSource found that in Kentucky, there are just six doctors who meet this criteria, four of whom have generally worked for coal companies and their insurers. Another is semi-retired, and has a certification that will expire in June. Miners and advocates say the new restrictions will likely make it harder for them to be awarded their benefits, which require companies or their insurers to pay for related medical expenses and provide a small stipend. The number of miners applying for benefits has risen in recent years, as Kentucky is one of several states experiencing an unprecedented resurgence in the most advanced form of black lung disease, which is progressive, debilitating, and deadly. Among the doctors who stand to be affected by the law is radiologist Brandon Crum of Pike County, Kentucky. Crum is the doctor who first alerted federal researchers to the spike in cases of severe black lung, which has since been confirmed as the largest cluster of the disease ever documented. The federal agency that grants the B Reader certification is the National Institute for Occupational Safety and Health, or NIOSH. Via email, NIOSH spokesperson Christina Spring said the agency was not contacted by Kentucky lawmakers in advance of the law. Spring said NIOSH plans to reach out to pulmonologists in Kentucky to offer assistance to those who are interested in become B Readers. She also added that there is no evidence to show that that B Readers methods differ on the basis of a background in radiology or pulmonology. In fact, they use the same standardized method of diagnosing black lung disease from X-rays. NPR’s Howard Berkes contributed to​ this story.